NIAGARA-ON-THE-LAKE, Ont. (June 22, 2015) — The tranquility of a vineyard, the sparkle of Lake Ontario in the late afternoon sun, the emerald slope of the Niagara escarpment make for a beautiful vista when enjoying the wares of Niagara’s VQA wineries. And with that, Marcel offers the five reasons you will hate Niagara Wine Country. The wines don’t all taste the same. In Niagara, it’s not simply something red, something white, something sweet, something dry. If that is what you are seeking, you will be grossly disappointed at the selection of wines available from Niagara wineries. Really, who wants to have to choose between stunning Rieslings, summery fresh Pinot Grigios, rich Cabernet Franc, a wide range of Cabernet Merlots and everything from everyday sipping wines to age-worthy reserve wines for your wine collection? Then there are the unique and seasonal wines, such as rich Viognier (how do you pronounce that anyway? ), Cabernet-based dry Roses and Gewurztraminer-Riesling blends. It’s too much choice! I mean, you might have to invest a weekend of your time to spend in Niagara wine country to taste your way through all those wines. There are dirty farmers everywhere – not to mention the “rats!” Just imagine, all the grapes these wineries use in their VQA (Vintners Quality Alliance) wines are grown right there in wine country. There are grape farms and farmers everywhere! The lush green of the vineyards and the orchards will hurt your eyes after a while. No traffic jams and honking, just a tractor or harvester coming out of nowhere. Don’t even start with the passionate winemakers and their dedicated crews of “cellar rats” turning the locally grown grapes from these vineyards into delicious wines that keep wine fans coming back for more. They are so damn accommodating all the time. If you are used to the stereotypical big city taxi driver attitude, you will be hugely disappointed coming to Niagara Wine Country! People are just so welcoming and accommodating there. As you walk into one of the many wineries in Niagara, winery staff welcome you, ask about the types of wine you usually enjoy, make recommendations of what to try — and may even give you a tutored tasting if you’d like … and if that wasn’t enough, they will also give you background information on the whole wine region, recommend the best places for lunch or dinner and will ship your wine to your doorstep if you bought more wine than you can, want to, carry home. You fill up your camera’s memory card. You better pack a few extra memory cards for your camera when you decide to visit this dreadful place! You’ll end up filling them up with endless numbers of pictures of you and your friends: in a vineyard holding a bunch of grapes, in front of an orange glow sunset in front of more grape vines, on the shore of Lake Ontario, holding a glass of wine, holding a bottle of wine, posing with the winemaker or winery owner, sitting on a winery patio with wine and charcuterie plate, standing in front of wine barrels, doing chocolate Icewine shooters or sitting in one of the restaurants enjoying Niagara’s local cuisine. These wineries are all about the $$’s and the bling. Niagara’s wines love the bling! … awards that is. Not just from here in Canada, but on the big international stage at the world’s largest wine competitions in the U.K., France, Italy, the Far East … the list goes on. Our Niagara wines keep getting recognized for all the hard work that goes into growing the grapes and making these great wines. Canada is renowned around the world for its Icewines, but experts are quickly learning that the elegant cool climate white and red wines from this picturesque wine region hold their own in the ever growing wine market place. You would think Niagara wineries would feel guilty about all this attention … but no. Instead, they are giving back to the local economy: When you buy a bottle of Ontario wine, it contributes $39.67 of economic impact to the local economy per bottle. That equates to a measly $3.3 billion in total economic impact to the Canadian economy. Who do these farmers, winery owners and winemakers think they are? 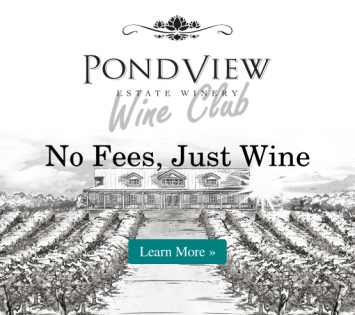 Drawing on more than three generations of winemaking experience, PondView Estate Winery is one of the newest additions to the Four Mile Creek appellation in the heart of Niagara’s wine country. Family owned by Luciano and Adriana Puglisi, PondView crafts exceptional Ontario VQA wines rooted in an Italian heritage. Luciano’s enthusiasm and respect for the winemaking process, alongside his dedication and commitment to excellence, earned him the prestigious title of Grape King in 2008, awarded by the Ministry of Agriculture to the finest vineyard operator in Ontario. The secret to the success of PondView Estate Winery is the long-held belief of the Puglisi family: Great wine is a harmony of earth and vine.